I admit I didn’t jump on the Harry Potter bandwagon when J. K. Rowling started publishing her novels about “the boy who lived” in 1997 (I’m just now reading the first book). I also didn’t feel too intrigued by the first films in the series, Harry Potter and the Sorcerer’s Stone (2001) and Harry Potter and the Chamber of Secrets (2002). They felt kind of clunky to me, ironically devoid of cinematic magic. But now, after eight movies and a couple of trips to The Wizarding World of Harry Potter later, I am more of a fan (the Pottermore Sorting Hat quiz puts me in Slytherin house, although I’d rather be a Ravenclaw). 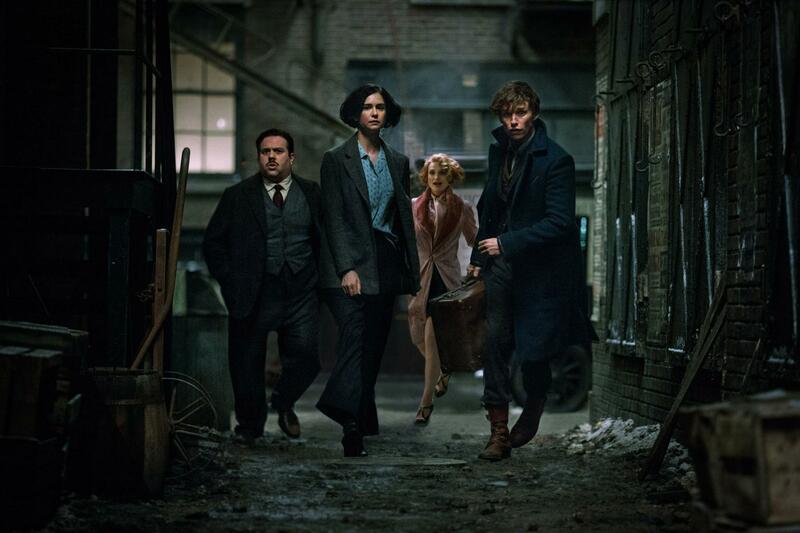 Jacob (Dan Fogler), Tina (Katherine Waterston), Queenie (Alison Sudol), and Newt (Eddie Redmayne) join forces. Fantastic Beasts and Where to Find Them is set 70 years before the events of the Harry Potter novels. Brit magizoologist Newt Scamander (Eddie Redmayne) arrives in New York with a suitcase filled with magical creatures, some of which promptly escape and start to wreak havoc. 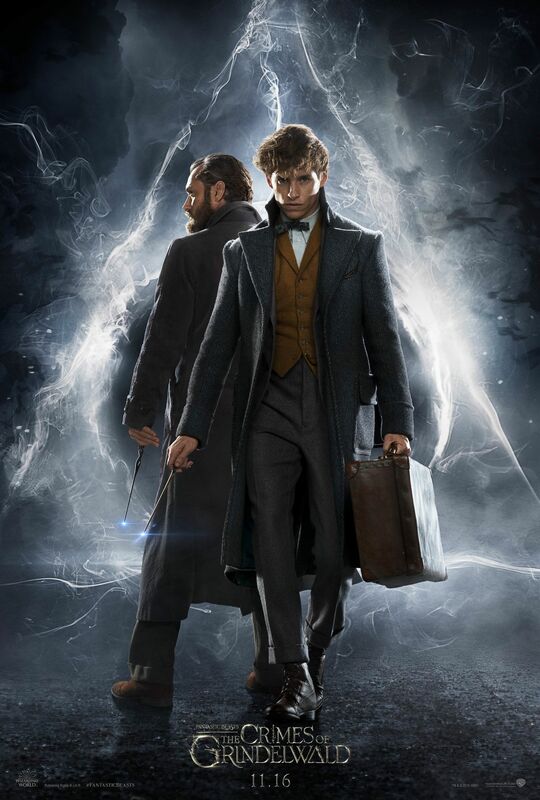 Newt is immediately accused of conspiring with an evil wizard by the name of Gellert Grindelwald, and with the help of auror Tina (Katherine Waterston), her legilimens sister Queenie (Alison Sudol), and no-maj baker Jacob (Dan Fogler), he must race to capture the missing beasts and clear his name. If all the nomenclature above is familiar to you, you’re a Rowling fan and will most likely enjoy this. If not, you may as well look elsewhere. Me? I’m somewhere on the fence. Fantastic Beasts and Where to Find Them is fun, but like those first two Harry Potter adventures, it never quite achieves the whimsical flight of fancy it need. It’s also too long and convoluted. You may find yourself hoping for Hermione to drop in with a time-turner and speed things along. Fantastic Beasts: The Crimes of Grindelwald picks up about a year after the events of the first movie. The captured wizard Grindelwald (Johnny Depp) escapes and starts to amass his followers in order to start a war with the muggles. Newt is recruited by professor Albus Dumbledore (Jude Law, playing the young version of the famous Hogwarts headmaster) to find Credence Barebone (Ezra Miller), a powerful obscurial who Grindelwald needs to defeat Dumbledore. It’s once again a mixed bag. Rowling continues to overcomplicate the plot so much, you wish she’d stick to writing books instead of screenplays. And just like in Fantastic Beasts and Where to Find Them, there’s a stiffness to the filmmaking that director David Yates can’t seem to shake, considering his four Harry Potter outings were much more engaging affairs. I don’t know. However, I did like Depp and Law as rivals (and former lovers? ), and the ending in which Grindelwald reveals Credence is Dumbledore’s long-lost brother is pretty nifty. Maybe third time will be the charm.